Ohio State's roots go back to 1870, when the Ohio General Assembly established the Ohio Agricultural and Mechanical College. The new college was made possible through the provisions of the Land-Grant Act, signed by President Lincoln on July 2, 1862. This legislation revolutionized the nation's approach to higher education, bringing a college degree within reach of all high school graduates. In 1878 the college's name was changed to The Ohio State University. 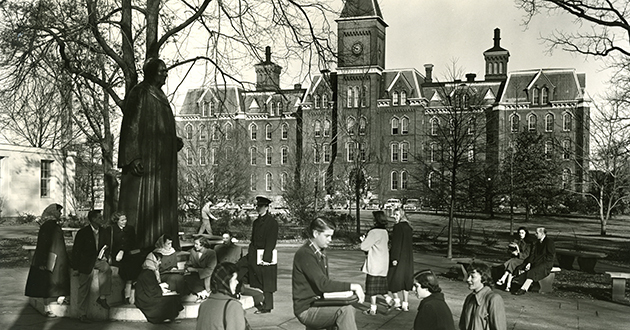 In most years before 1968, Ohio State’s arts and sciences programs were organized within a College of Arts and Sciences. In 1968, the college divided into five colleges: Arts; Biological Sciences; Humanities; Mathematical and Physical Sciences; and Social and Behavioral Sciences. In 2010, the College of Arts and Sciences was reunified by a unanimous vote of the university’s Board of Trustees, reincorporating the five legacy colleges and defining the academic heart of Ohio State. Recombining the arts and sciences has resulted in the creation of one of the most powerful intellectual platforms in the world. In partnership with Ohio State’s professional and health science colleges, are a leader in fostering research, scholarship, creative activity and teaching in basic disciplines and interdisciplinary programs in the performing and visual arts, humanities, and social, biological, natural, and mathematical sciences, not only for the university but for the nation.